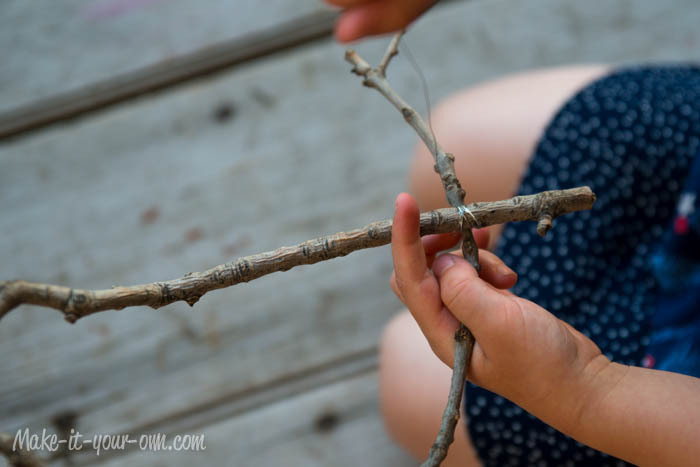 Use found sticks to make a mobile base- add whatever your child is interested in (e.g., birds, planets, fairies etc.) 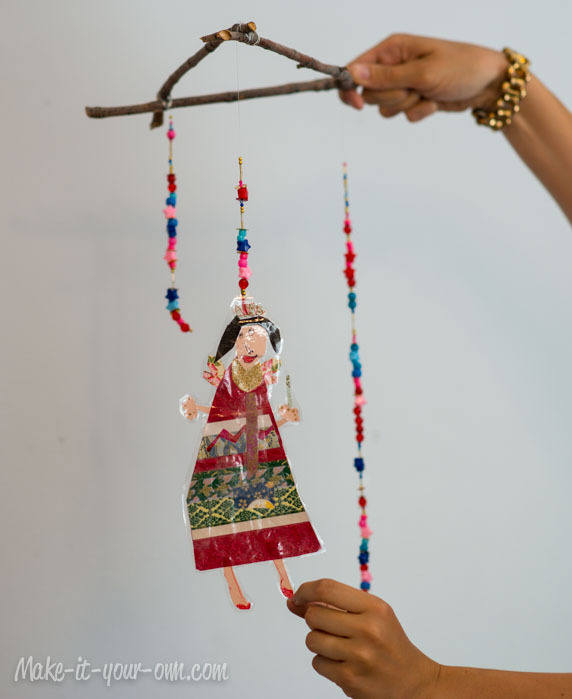 We used to preserve some of the work that our children had already created and wanted to display in a different manner. 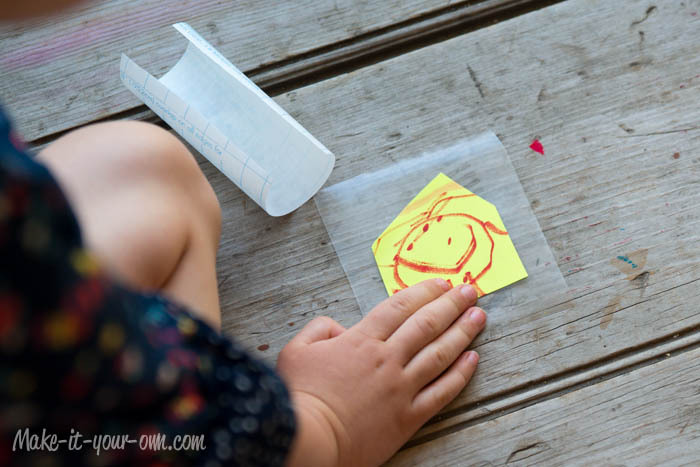 This project was featured on The Crafty Crow– an amazing website for both parents and educators! Be sure to check it out! 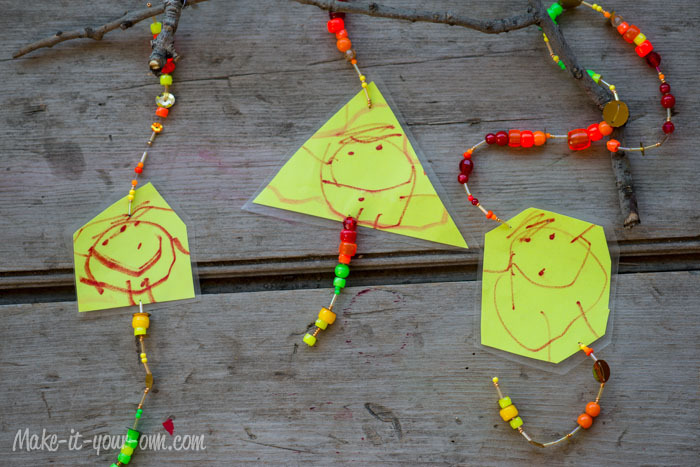 This activity was also featured on Fun Crafts Kids. And indeed it is fun! Take a peek! 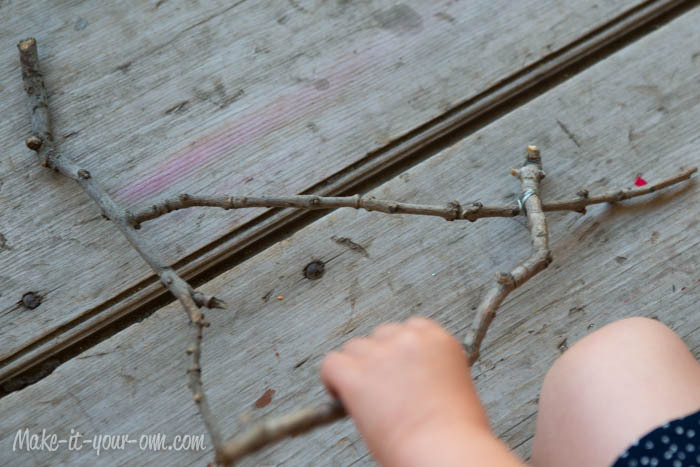 Go out for a nature walk with an adult and collect 4 sticks that are approximately the same length. You could also do 3. We wanted a challenge so we looked for sticks with a fork in them and then one more to add to make a 3-sided mobile base. If you go with the option of 4 sticks, place 2 of the sticks down in a parallel fashion. Place the other 2 on top on the opposite side. 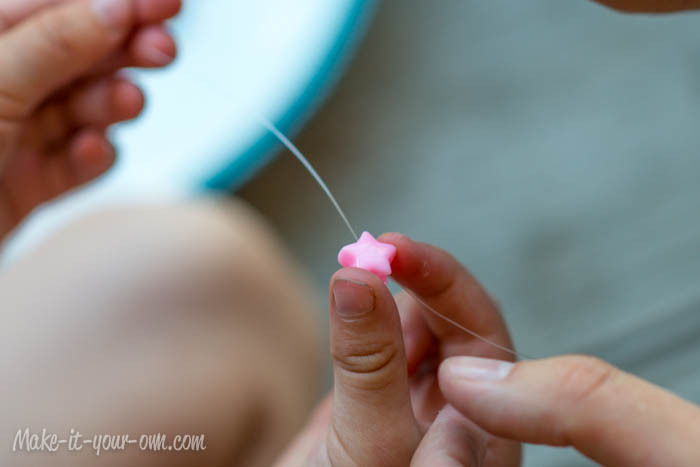 Wrap the corners with craft wire and secure them with a few knots. We found that to make it sturdy you want to wrap the wire in several different ways around the sticks (forming an “x” of sorts). Wrap your sticks with wire and beads, should you like. 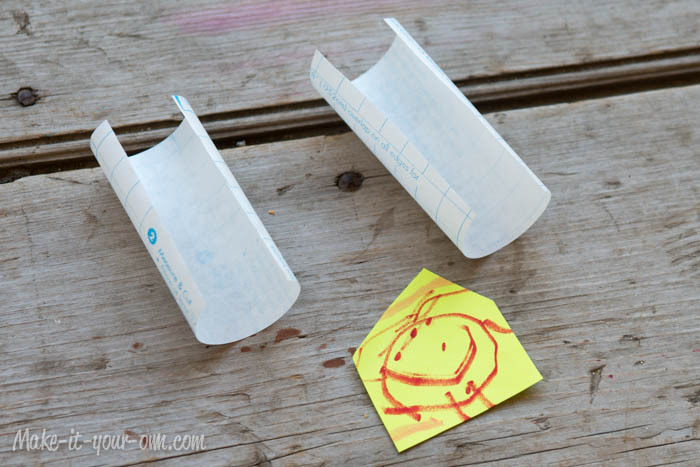 Cut out two pieces of contact paper a bit bigger than your child’s artwork piece. Peel off the backing and lay the first piece sticky side up. Place the artwork piece in the centre. Peel off the backing of the second piece and lay it over the artwork with the sticky side facing down. (So the two sticky sides face each other, creating a sandwich and covering the work to preserve it.) 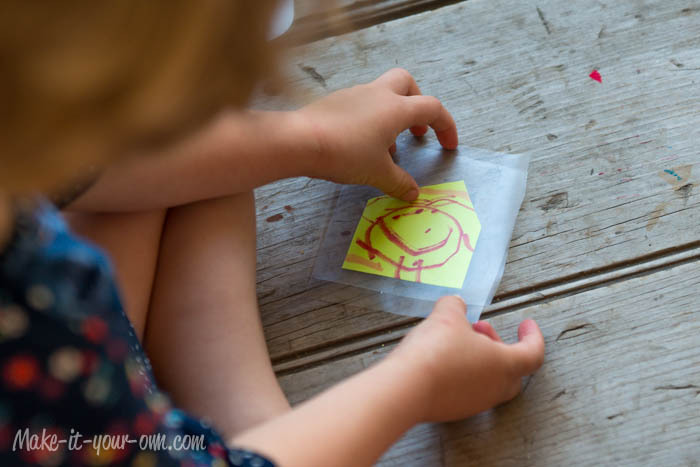 Depending on the age of your child, they may need adult assistance with this step, as it is difficult to reposition once the pieces are stuck together. Smooth out any bubbles (pushing them to the edges) that might occur. 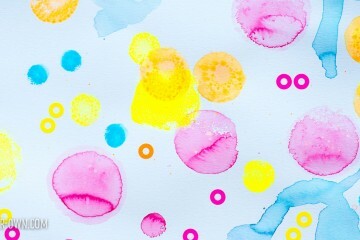 Cut around the edges of the finished artwork covered in contact paper, leaving a border of approximately 1/2- 1 centimetre or 1/8- 1/4 of an inch. You could laminate the work instead if you prefer that finish. 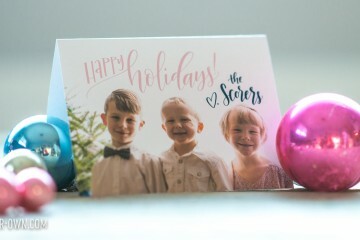 OR if you don’t want your cord to show in the final product cut a long piece and insert it in between the artwork and the cardstock before gluing, including it in the process of covering the piece with contact paper. However, you would not want to put the cord through the laminator (if you are using this option) as it will likely melt and/or cause a jam, damaging your machine. 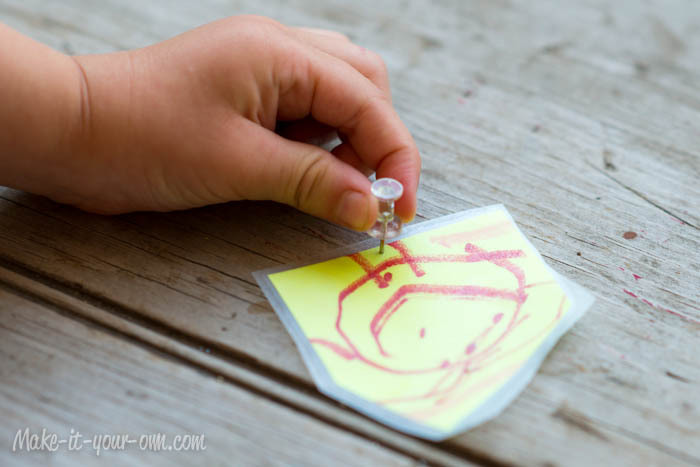 Using a pin, poke two small holes in your child’s artwork near the top and the bottom. For large pieces you may need to do a few more. 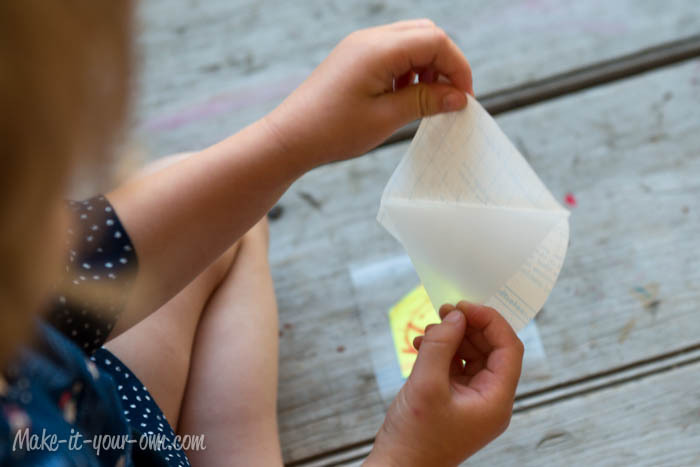 If you are using a thicker material such as twine for your mobile, you may want to use a small single hole punch and make two holes. 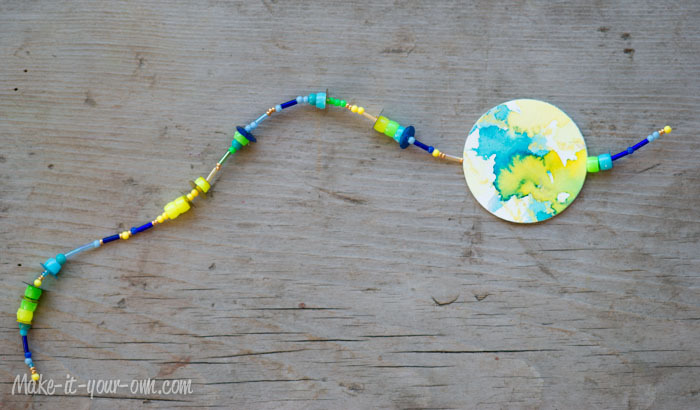 Once you have your beads laced onto your cord (for under the piece, knotting one at the bottom for an anchor), put it through the front of you artwork at the bottom where you punched the first tiny hole and then lace it up the top hole. Add some more beads should you like for above the piece. 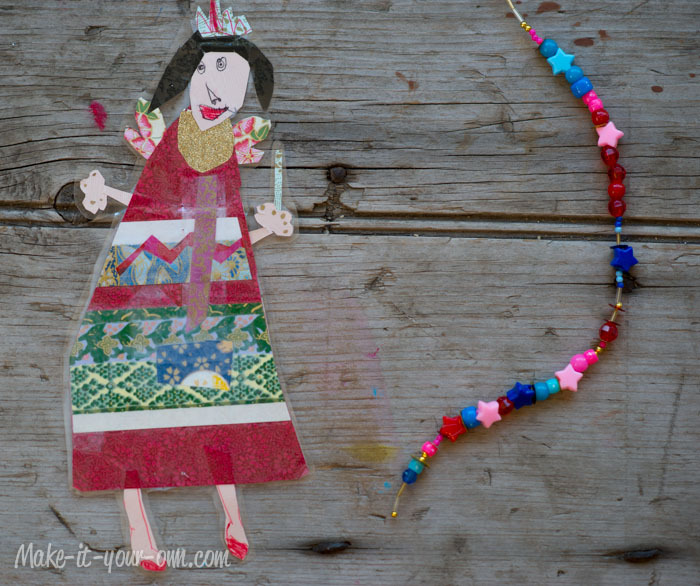 Create other cords of beads and/or beads and artwork. Secure your cords to the branches with several knots and cut off the excess cord at the top and bottoms. 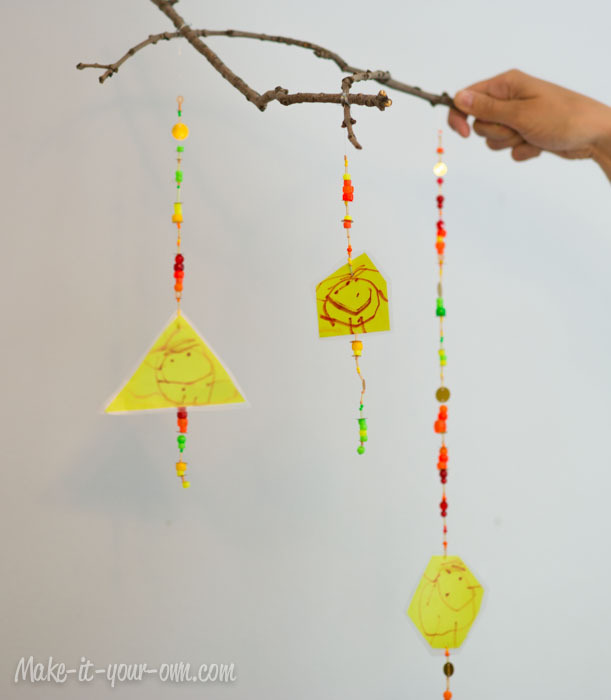 Take additional cord (we used 3 pieces as we made 3 sided mobiles) and tie one end of each piece onto the middle of each of the sticks. Bring all the pieces together at the top so that they are equal and tie them together to form a hanging knot. Have an adult hang your mobile on the ceiling for you. Beads are a choking hazards and are not meant for children 0-3 or those that tend to put things in their mouths. Exercise caution for sharp ends when using wire. Have an adult cut it for you. Cord, lace, twine etc. can pose a strangulation hazard- exercise proper use of these materials. Laminators are meant for adult use. Be careful when using a pin not to poke yourself or damage the surface underneath. 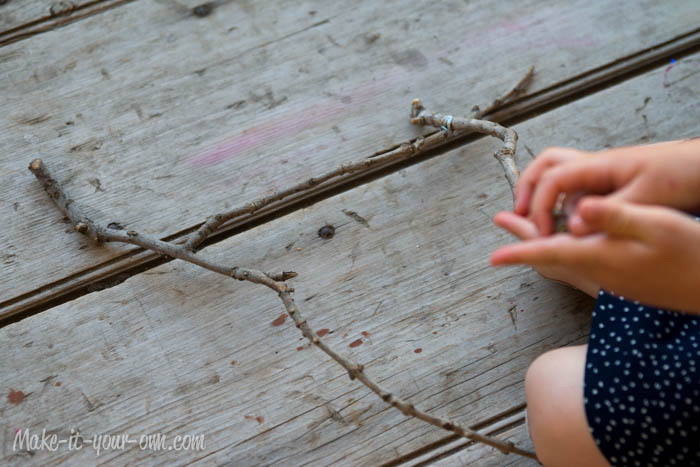 When working with sticks, be cautious as not to scratch yourself or others. Thank you! We are honoured that you share our projects with your readers. 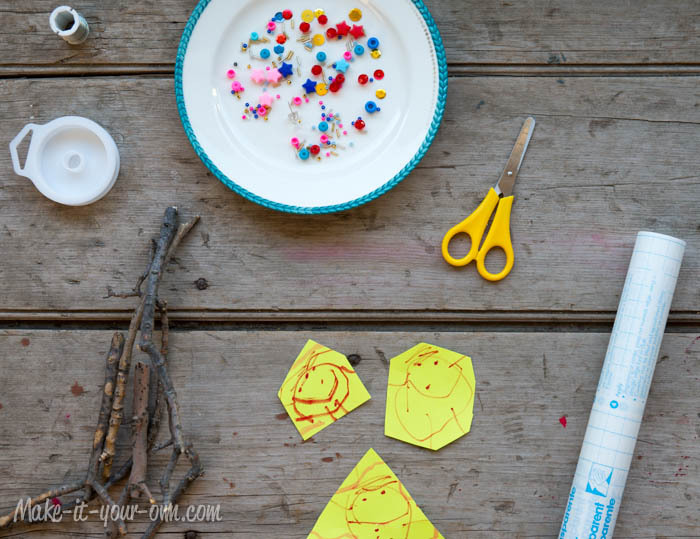 Your site is a delightful collection of engaging and playful activities (for all ages!). P.S. 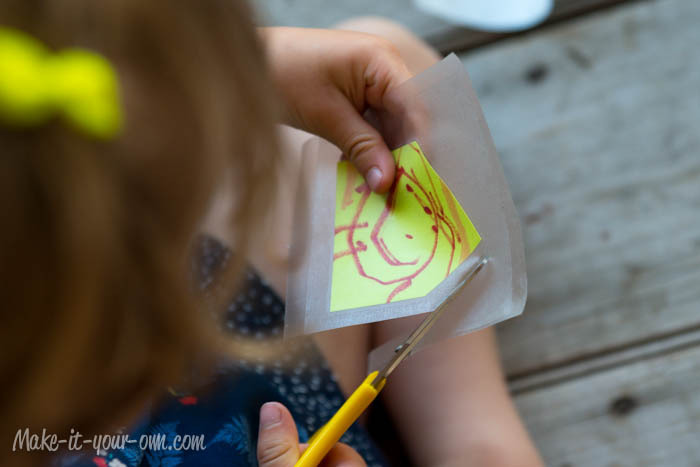 We always love sharing reader’s projects if you do get a chance to do the activity with your kids!